Window and door screens can get damaged over time. Usually it’s due to holes, wear and tear and sun exposure. It can also be dirt, grime, even paint making it difficult to clean. If this is the case, then you may want to repair the window or door screen. It’s cheap, efficient and easy to do even if you have little DIY experience. In this post we will walk you through the process of window and door installation and repair. Let’s start with the installation process. This is for people that currently don’t have a door screen but would like to install one on other exterior doors. Keep in mind that this guide is for regular swinging doors on hinges. 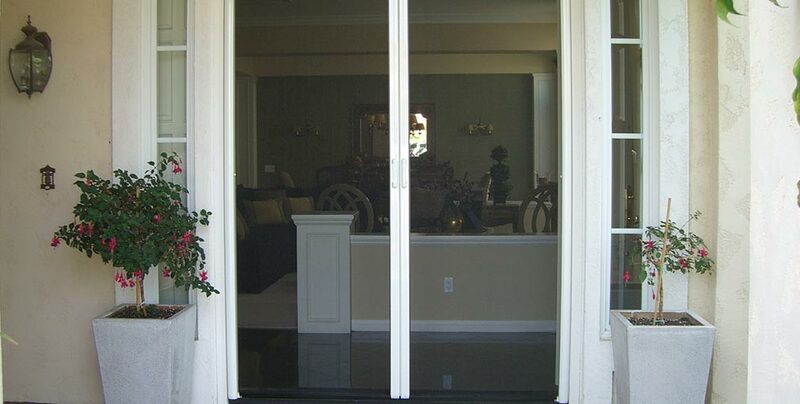 If you have a sliding door, you may need to replace the entire screen door. Or get a separate rail that allows you to install a separate door screen. First, we need to start by measuring your door. You’re going to want to measure the inside of the door frame and keep those measurements handy. Doors are often around 200 cm in height, but the width can differ depending on your style of home. Keep your exact measurements, then round those measurements down by 1/2″ in height and 3/4″ win width. Then you will have measurements for your door screen frame. The reason we round down is so that we have a bit more space to fit the door screen itself. For example, if you measured that your door frame height is 80″ you’ll want to consider it 791/2″. There are a couple of things to consider when picking a screen door for your needs. Make sure you look around at the measurements of each screen door and compare them to your own. Sizes are generally standardized. As a rule of thumb always get a screen door that is slightly smaller than your measurements and never above. Having a slight gap between your door frame and the screen door is fine and helps it fit . Don’t go too small. You’ll also need to think about the design of the screen door. There are basic wooden doors. There are some made of metal and there are some which only have a screen on the top half of the screen door. What you pick is up to you. We recommend choosing something that compliments the exterior of your home. so that it fits the theme. Do keep in mind that if you want to paint it, wood is the better option. If you’d rather not paint, then a vinyl or aluminum screen door is a great option, albeit a little more expensive. You can find some rather unique designs when looking for screen doors. You don’t want to pay too much unless you’re serious about getting something unique, and interesting to look at. You can get inexpensive screen doors at most hardware stores and they’ll do fine. When it comes to screen mesh, there are two common materials used; nylon and metal. Nylon and metal meshes are affordable and common. You can also get solid screens which are far more durable. Yet, they can get a little expensive so stick with a mesh option if you’re on a budget. Tip: You can always test out the different types of screen door materials by going to a hardware store. You can even ask for help if you’re unsure which to choose. The next thing to do is to examine your screen door. This is something that you should do at the hardware store. But if you don’t have time, then it’s best to do it now before you install the screen and frame. Ensure that there are no tears in the screen material. Is the frame of the screen door itself is intact? Is free of any kind of dents, marks and scratches? This can weaken the frame considerably. Manufacturing defects should be reported to the store you bought it from. If so, get a replacement or a refund. Be careful of small holes. They could be prime locations for bugs to fit through and cause damage. Also, if the door is weak then your pets could damage it if they or leap onto it. If nothing is wrong, then you can go to the next step. Start with deciding the orientation of the door. The handles should be on the same side of the door. There are cases where it might not be possible such as if the handles get in the way of the doors. Or if there are other obstructions in the way. Once decided, you can then install the screen door. It’s helpful to have an extra pair of hands to give you some help. Your screen door might not seem heavy, but it’s helpful to have someone hold the door while you’re drilling it in. Now you’ll want to measure where your hinges are going to go. You want to place the hinges at a similar position to the hinges of your existing door to make it easier. Have someone hold the screen door against the door frame and slot it in to ensure it fits. Then, using a pencil, make where the hinges are on your new door screen. Ensure that the hinges you use are of similar size so that the measurements make sense. Using the marks you made with pencil, you can then drill in some pilot holes for the screens by aligning the hinge you plan to use against the door. Drill the necessary number of pilot holes for each hinge. Then screw them in. Be careful to hold the hinge in place as best you can to ensure it doesn’t spin around when you’re drilling it in. Once you install the hinges, you can then move on to drilling it into the door frame. Start by asking someone to hold the door up while you drill pilot holes and screw the hinge in. Once the door screen is installed correctly, you should have a fully-functioning screen door. Adjust if needed and double-check to ensure that the hinges are installed correctly and that the screws are in properly. Now all that’s left is to install a handle or knob to the screen door and you’re good to go! Tip: An extra pair of hands is always useful on this step. If you already have a door screen then you have the option of simply replacing it. You can either replace the entire frame by following the steps above, or you can remove just the screen and replace it. The first step is to remove your screen door from its hinges. You can do this on your own, but it’s safer to do this with a friend or a family member helping you. Ask them to hold on to the screen door so that as you remove it from its hinges. You’re not at risk of having the screen fall on top of you. Tip: You want to be removing the screen door from its hinges! Don’t make the mistake of removing the entire hinge from the door frame! Keep the screws safe so you can reuse them afterwards. First, pry out the existing spline. It’s a long plastic piece that is usually black in color. You can use a narrow-tipped screwdriver or a prying tool to remove a piece of it off. Once you get a firm grip of it, you can pull it out of the groove. Remove the entire spline and then remove the old screen and discard it. Once removed, clean up the groove and wipe down the frame to get rid of any dust and grime. Tip: If your spline is new then you can reuse it. (For instance, if you ripped it and need to replace it again However, we always recommend using a new spline. If you’re unsure of the spline used, take a cut of it to the hardware store and ask them which size you need. Roll out the screen on top of the screen door frame and remove any excess. You want to leave at least an inch of the screen around the entire frame so that you have room for error. Once laid out, cut the corners of the screen at a 45-degree angle, stopping at the inside corner of the screen door frame. This is to prevent the screen from warping once you reach the corners. Tip: Make sure you purchase the right screen for your needs. Get a roll that is large enough so you avoid running out of it. Next, we’re going to need a roller tool. These are made for repairing door screens and often come with two ends; a concave and a convex side. The convex wheel is a thin flat edge whereas the concave wheel has a groove. The concave wheel is to shape metal screens. They fit into the groove before installing the spline. For convex wheel is to push the spline into the groove with the screen beneath it. For fiberglass screens, no shaping is needed and you can use the concave end. Start at one corner of the screen and fit the spline into the groove. Then, roll using your tool and push the spline into the groove with the screen underneath it. This will trap the screen and spline into the groove and hold it tight. If the screen wrinkles or moves around too much, then simply pull on the spline to release the screen and go again. Once you’ve done the entire door screen, you can use a knife and cut off the excess screen. Now you can attach the door back onto your frame and you’re finished. Tip: Make sure you don’t pull too tightly when installing the screen because it can rip or damage if you’re not careful. The process for windows is largely the same. 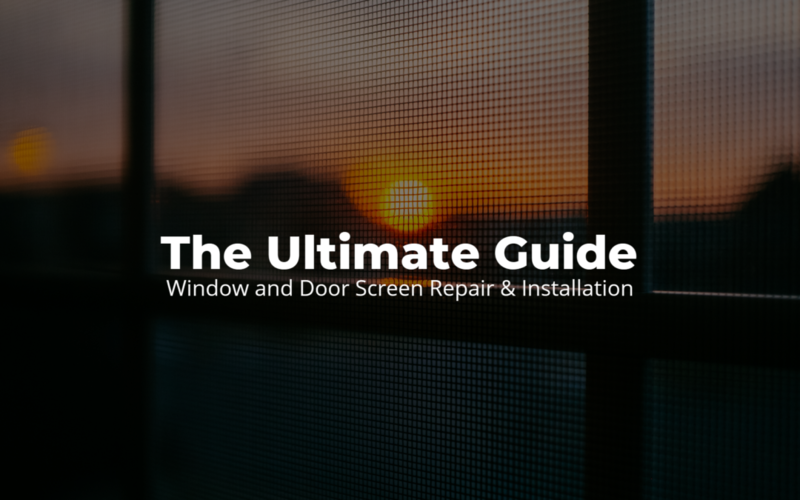 You can follow the same steps as repairing a door screen if you need to replace your window screen. The only difference will be in how you remove the existing screen. In most cases, the window screens are attached with tension clips in the channels. Pull on one side of the window screen to figure out where the tension clips are. Then lift it away to remove the window screen from the frame. Now you can replace the screen and then install it the same way you removed it. You can also purchase screen frame kits which make it easy for you to create your own window screens. This will require measuring your existing window screen so you can get the right measurements for it. Window screen kits come with four frame pieces. They can be cut to size depending on how large your windows are, and four corner pieces to connect the frame pieces. You’ll also get at least two tension clips that will fit on the two corners of one side of the screen. Also two plastic clips which can be used to easily remove the window screen in the future. As you can see, replacing and installing window and door screens isn’t difficult but it may be challenging for someone who’s never done it. If this is a little over your head or just want to get it done right the first time, contact Brian’s Window Service. We’ve been screening windows and doors for over 40 years!